Bacterial infections of the bladder can make your urine more acidic than normal – which causes the painful and burning sensations you get when passing urine. 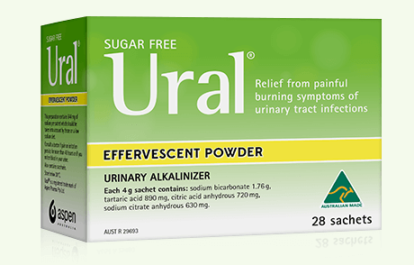 Ural Effervescent Powder is a urinary alkaliniser, which works by raising the pH of urine. This makes the urine less acidic which provides effective relief from the pain of cystitis. Sodium bicarbonate 1.76 g, tartaric acid 890 mg, citric acid anhydrous 720 mg, sodium citrate anhydrous 630 mg. Also contains: saccharin sodium, lemon oil flavouring. Dissolve 1-2 sachets in a glass of cold water. May be taken up to 4 times daily. 28 sachet packs and convenient small sized packs of 8 sachets at your local pharmacy. 20 sachet packs from Woolworths, Coles and selected IGA stores. Where can I find Ural Effervescent Powder? 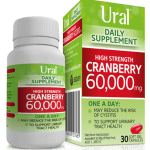 Pleasantly flavoured Ural Cranberry Effervescent Powder helps support a healthy urinary tract by reducing the ability of bacteria to stick to the wall of the urinary tract. Cranberry extract also has antioxidant properties which help protect against free radicals. Vaccinium macrocarpon (Cranberry) fruit juice dry 368.3 mg, equiv. fresh juice 9.2 g. Also contains: sodium bicarbonate 1.75 g, tartaric acid 500 mg, citric acid anhydrous 714 mg, sodium citrate anhydrous 625 mg, silica colloidal anhydrous 10 mg, saccharin sodium 8 mg, magnesium hydroxide 23.8 mg, calcium phosphate 4 mg.
Dissolve 1‐2 sachets in a glass of cold water. May be taken up to 4 times daily. 28 sachet packs at your local pharmacy. 20 sachet packs from Woolworths. 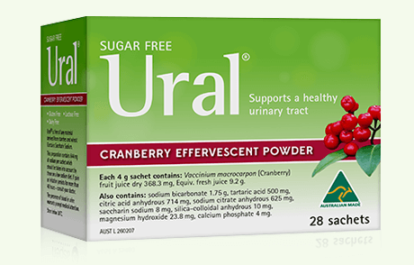 Where can I find Ural Cranberry Effervescent Powder?